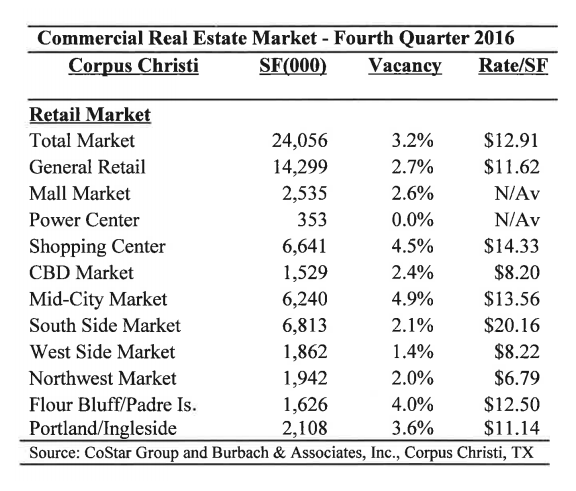 CORPUS CHRISTI – The local retail market contained approximately 24 million square feet as of fourth quarter 2016, according to Burbach & Associates and CoStar Group. The overall vacancy rate was 3.2 percent in 4Q 2016. The average total market rental rate was $12.91 per sf, with general retail showing $11.62 per sf. Be sure to check out the Corpus Christi Market Research!